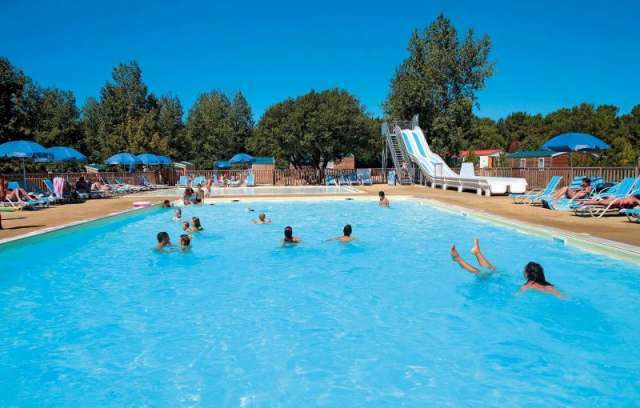 The holiday home is located in the department of Vendée, with its 240 km of beach and extraordinary sun hours (2600 hours per year) the ideal destination for a relaxing holiday. The residence is located in a wooded domain of more than 14 hectares, just 200 meters from the beach of Demoiselles and only 2 km from the nearest shops. In this beautiful, wooded area there are numerous possibilities for recreation and relaxation. Within a radius of 3 km you will find a cinema, disco and a casino (Saint Gilles Croix de Vie, Saint Jean de Monts). Culture lovers can visit the numerous museums and beautiful castles in the area. You can enjoy numerous sport activities such as golf and horse riding. You can also take sailing, diving and surfing lessons. The residence is the ideal starting point for tours along walking and cycling routes. There is even an adventure trail in front of the residence and the Atlantic Toboggan aquapark is nearby. The resort's amenities include a heated outdoor swimming pool with plunge pool and parking. Vendée is the perfect holiday destination with its 240 km of beach and an extraordinary amount of sunshine (2600 hours per year). First there is "Vendée Blue" with the islands of Yeu and Noirmoutier, an extensive range of water activities, small fishing ports and salt marshes where you can see how salt workers practice their traditional craft ... Then there is "Vendée green" with its lush oak forests and sea pines, the Marais de Potevin also called "the green Venice", the wealth of the hinterland with its castles, abbeys and mills that tell the story of Vendée ... The resort offers many activities for holiday pleasure: horseback riding, sailing, diving, surfing, walking and cycling. There is an 18-hole golf course at Saint Jean de Monts, one of the finest golf courses on the Atlantic coast. Places worth a visit: the island of Noirmoutier (40km) with its 12th century castle and archaeological exhibitions (open all year); the island of Yeu (sailing by boat from Saint Gilles Croix de Vie); the salt marsh of Riez (open from 15/06 to 15/09); the salt route by boat to Sables d'Olonne; the Automobile Museum in Talmont Saint Hilaire; the Ecomuseum of Bourrine, located in a typical Vendean house (open all year); the Shell museum (open all year). You can take a fragrant walk among the flowers of the Olfacties garden or visit the beautiful castles of Apremont (20 km, open from 30/03 to 15/09), the castle of Richard Coeur at Lion-Talmont St. Hilaire (open from 30 / 03 to 15/09, medieval performances from 01/07 to 30/08) and the castle of Guignardiere with its 86 hectares park (open every Sunday throughout the year, open every day from 01/06 to 30/09). Children can enjoy the Vallees leisure park with its slides, minigolf, outdoor games (open on the weekend of May / June and open daily in July / August). Every Monday, Tuesday, Thursday and Friday morning there is a market, as well as Wednesday and Saturday afternoons in high season and Tuesday and Saturday mornings in low season. On a wooded area of more than 14 hectares Domaine is 200 meters from the beach of the 60 terminals and 2 km from the shops. Mobile homes 4/6 and 6/8 people are fully equipped with terrace with garden furniture. At your disposal: heated swimming pool with children's pool and slide open from mid-May to mid-September, a snack bar (open daily in July / August), WiFi access at reception (for a fee) and parking. A deposit of 300 euros must be paid on arrival (this will be refunded after inventory the day of departure, or by post). The mobile home must be left clean, otherwise a legal sum will be deducted from the deposit. A city tax must be paid the day of arrival (per person per day). Included in the price: heated outdoor pool with plunge pool, open until mid September; parking. Not included in the price: WIFI access 5euro / day, 20euro / stay; bed linen is not provided, the rent is 11 euros / person; TV rental 40euro / week; baby equipment rental 25euro / stay; pets are allowed for 50 euros / stay (1 pet per mobile home) provided they have a current chip and vaccination; final cleaning on request from 56euro.